Son of Shealtiel (Ezra iii. 2, 8; Hag. i. 1; "Pedaiah" in I Chron. iii. 19 is probably a scribal error) and grandson of Jehoiachin. The name is either the Hebrew (= "begotten of [in] Babylon"), although compounds with the passive participle, frequent in Assyrian, are rarely, if ever, found in Hebrew; or, more probably, it is the Assyro-Babylonian "Zeru-Babel" (= "seed or offspring of Babylon"). It is a moot question whether or not he was identical with Sheshbazzar, "the prince of Judah" and leader of the first great band of exiles returning to Jerusalem from Babylon under Cyrus (Ezra i. 8). On the one hand, it is urged that he is regarded as the head of the community of returned exiles (Ezra iv. 2), that he is associated in this capacity with the high priest Jeshua in the general administration (Ezra iii. 2, 8; iv. 3; v. 2; Hag. i. 1; Zech. iii.-iv. ), and that the same title of governor ("peḥah") of Judah is given him by the prophet Haggai (i. 1; ii. 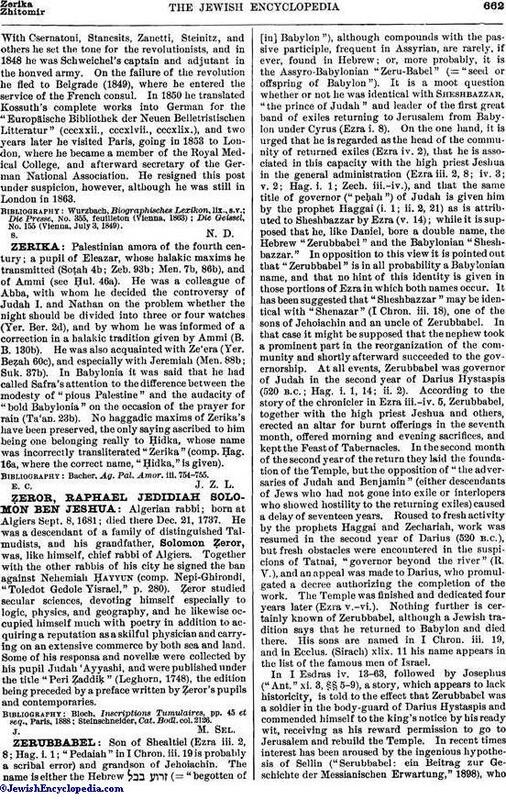 2, 21) as is attributed to Sheshbazzar by Ezra (v. 14); while it is supposed that he, like Daniel, bore a double name, the Hebrew "Zerubbabel" and the Babylonian "Sheshbazzar." In opposition to this view it is pointed out that "Zerubbabel" is in all probability a Babylonian name, and that no hint of this identity is given in those portions of Ezra in which both names occur. It has been suggested that "Sheshbazzar" may be identical with "Shenazar" (I Chron. iii. 18), one of the sons of Jehoiachin and an uncle of Zerubbabel. In that case it might be supposed that the nephew took a prominent part in the reorganization of the community and shortly afterward succeeded to the governorship. At all events, Zerubbabel was governor of Judah in the second year of Darius Hystaspis (520 B.C. ; Hag. i. 1, 14; ii. 2). According to the story of the chronicler in Ezra iii.-iv. 5, Zerubbabel, together with the high priest Jeshua and others, erected an altar for burnt offerings in the seventh month, offered morning and evening sacrifices, and kept the Feast of Tabernacles. In the second month of the second year of the return they laid the foundation of the Temple, but the opposition of "the adversaries of Judah and Benjamin" (either descendants of Jews who had not gone into exile or interlopers who showed hostility to the returning exiles) caused a delay of seventeen years. Roused to fresh activity by the prophets Haggai and Zechariah, work was resumed in the second year of Darius (520 B.C. ), but fresh obstacles were encountered in the suspicions of Tatnai, "governor beyond the river" (R. V.), and an appeal was made to Darius, who promulgated a decree authorizing the completion of the work. The Temple was finished and dedicated four years later (Ezra v.-vi.). Nothing further is certainly known of Zerubbabel, although a Jewish tradition says that he returned to Babylon and died there. His sons are named in I Chron. iii. 19, and in Ecclus. (Sirach) xlix. 11 his name appears in the list of the famous men of Israel. In I Esdras iv. 13-63, followed by Josephus ("Ant." xi. 3, §§ 5-9), a story, which appears to lack historicity, is told to the effect that Zerubbabel was a soldier in the body-guard of Darius Hystaspis and commended himself to the king's notice by his ready wit, receiving as his reward permission to go to Jerusalem and rebuild the Temple. 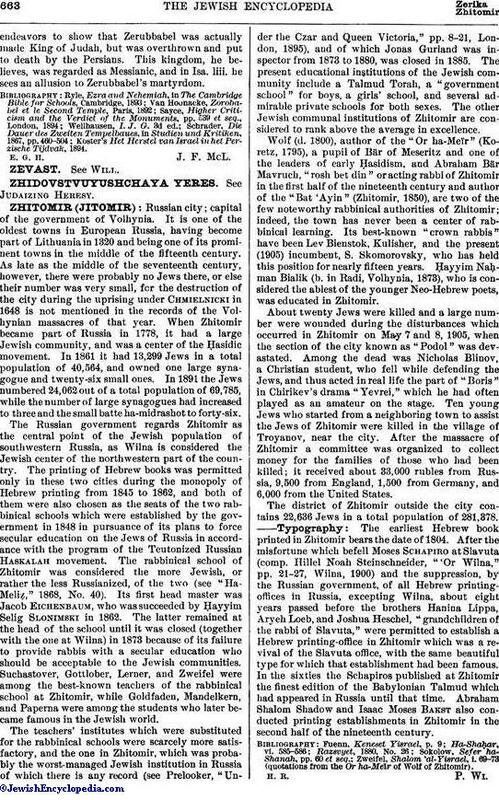 In recent times interest has been aroused by the ingenious hypothesis of Sellin ("Serubbabel: ein Beitrag zur Geschichte der Messianischen Erwartung," 1898), whoendeavors to show that Zerubbabel was actually made King of Judah, but was overthrown and put to death by the Persians. This kingdom, he believes, was regarded as Messianic, and in Isa. liii. he sees an allusion to Zerubbabel's martyrdom. Koster's Het Herstel van Israel in het Perzische Tijdvak, 1894. E. G. H. J. F. McL.